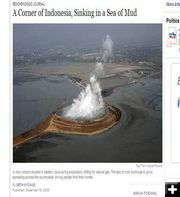 Mud Volcano New York Times website screen capture showing article on the natural gas mud volcano in Indonesia. Here’s an article that adds a different perspective on all the discussions and issues related to natural gas drilling in the Upper Green River Valley. In December, the New York Times had a story about a huge, steaming mud volcano that began in May, 2006 in Renokenongo, Indonesia, and is oozing out across the countryside swallowing villages in its path. The volcano is apparently the result of exploratory drilling for natural gas which tapped into a pressurized zone causing an eruption of water, gas and mud that continues to flow at about 100,000 cubic meters a day. The mud flow has buried homes, factories and land and forced the relocation of roads, bridges, a railway line and a major gas pipeline. More than 46,000 people have reportedly become sick with respiratory problems since the mud eruption. Experts say the flow of mud could go on for years or decades.